As well as creating stories about things that happen to the Dolls, practitioners use them for a range of other learning activities that foster equality and inclusion. Safina, one of the Persona Dolls, was about to turn four. 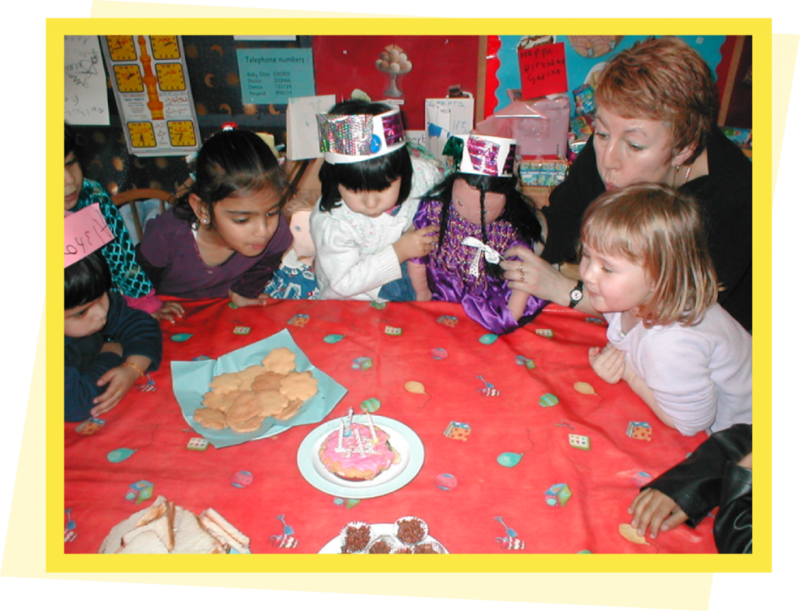 The children were told that she was going to have a birthday party at school just like they have. Various learning activities were set up; some adult led and others child initiated. A clothes shop was organised in the role-play area. Two of the girls decided to take Safina to the shop and buy her a shalwar and kamize to wear on her birthday. At the shop they measured the clothes on Safina to buy the right size and exchanged play money for their purchase. They talked about the colour and whether they wanted a plain or patterned kamize before a decision was made. What should be eaten at a party was discussed and the children then ‘wrote’ lists of food and recipes and made sandwiches, pizza, biscuits and birthday cakes. Party games were practised outside some with music and instruments and others with the parachute. At the party four candles were lit and Happy Birthday sung. It was hard work for the staff, but all agreed it was a worthwhile experience for the children. For weeks afterwards while looking at the book that had been made of the day, children asked when the other Persona Dolls were going to have their birthdays.